Junior Bri Modic shot the Raiders into a big early lead in the first quarter scoring 10 points in the frame. Izzy Lamparty was also a threat in the quarter scoring 6. The Raiders outscored the Rebels 21-5 in the 1st Quarter. The Rebels only points came at the foul line. In the 2nd quarter although the Raiders were maintaining a lead some key players got into foul trouble. Maddie Durkin picked up her 3rd personal in the quarter which sent her to the bench for a while. The Rebels did a good job getting to the foul line, unfortunately for them their shots would not fall. Crestview 2/8 from the line in the 2nd quarter. This would help the Raiders take a commanding 36-17 lead into the locker room. The third quarter is where the Raiders really took a stranglehold on the game. The inside presence of both Lamparty and Dani Vuletich opened up shots for Bri Modic as she tallied 11 points in the 3rd to bring her total to 21. The Rebels did show a little more life on offense, just not nearly enough to keep up with the Raiders, who lead after 3 60-33. 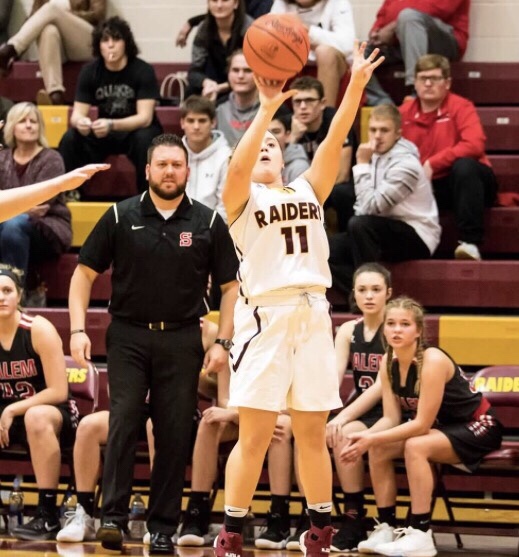 The final frame was clean up work for the Raiders senior Sam Patrone continued her streak of games with a three as she hit one late in the 4th to give the Raiders their final 3 points of the game. The Rebels while not looking great on offense got to the foul line 31 times but just shot 42% from the charity stripe. Bri Modic lead the Raiders with a season high 21 while Izzy Lamparty added 15. Dani Vuletich also got into double figures with 14. The Lady Raiders return to action Saturday as they travel to Struthers to play Brookfield on a neutral court. Varsity only, and the tip time is 3:00.